Welcome to Camberley Removals and Storage. We are a family run & owned professional removal company since 1976. Providing a comprehensive removal service whether you are moving to store or directly to another house. We move customers from any destination in the UK, but primarily from Berkshire, Surrey and Hampshire with our head office in Surrey. We used Camberley Removals to move the contents of our three-bed house and garage 4 miles to a nearby village. After a recommendation from a friend, I called to arrange for an estimator to visit us. From this first contact, I found the staff to be really helpful in arranging a time to visit that fitted in with my work schedule. The estimator who visited offered some excellent, impartial advice in selecting a removal firm. The following day we were provided with a very competitive quote which we accepted. We were provided packing tape and boxes free of charge (competitors charge for their boxes) as we were packing ourselves, and on the day of moving the team brought additional boxes and even helped us pack some of the remaining items! All of the guys who came to do the removals were polite and friendly. They worked extremely hard and were very careful loading and unloading. I would thoroughly recommend Camberley Removals to assist you with a move. We used Camberley Removals in September 2018 for the full packing service and our move 1 mile across town. The office staff were all helpful and efficient, and the moving team that packed and moved our things were brilliant. Experienced guys who worked really hard and were friendly and helpful throughout. When we ended up with a late key, 2 more staff were sent out to speed our move so we were still all moved in by 5:30pm. Excellent service that I would recommend to anyone. Moving house could be quite stressful, but the removers arrived on time and worked very hard and with good humor. The whole operation went very smoothly and they made light work of our furniture. I would happily recommend them. The rates were very competitive. The prepackaging service was excellent. Very friendly staff who were extremely helpful, super efficient and could not be more helpful. All arrangements and contact with the office staff was a efficient. Critically what was arranged was done, on time, to a very high standard and stress free which was a joy!! I was very impressed with the service Camberley Removals offered. Nothing was too much trouble for the removal guys. Very helpful, careful and friendly. I would definitely recommend them. Fantastic service, honest, reliable. Used them for our last move 10 years ago and as we were so pleased used them again for our latest move. The guys were up against it as we moved in the snow and we were going to a road with several hills and they made it with our remaining load when someone else trying to get to our house had to abandon their car! Very impressed. Also, Andrea & Debbie in the office, great communication. Thank you! The team did a very good job for us, despite problems with a very late completion time. Professional, polite and considerate Helpful and efficient. Very accommodating to minimise the hassle of a stressful move for us caused by problems with the rest of the chain and were very understanding. We’re very pleased we went with them and would recommend them unreservedly. Really impressed with all of the team. Very professional and friendly office and removal staff. Exceptional value for money compared to other Bar firms. Highly recommended!! 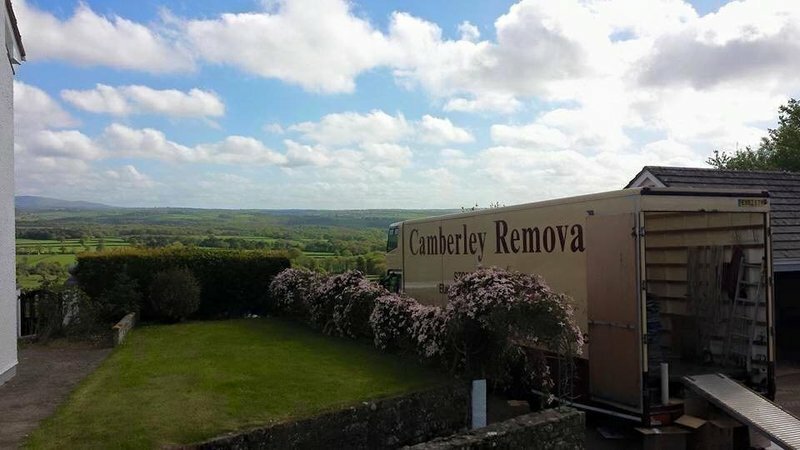 We would highly recommend Camberley Removals to anyone moving home. The staff were brilliant, they were polite, efficient and worked very hard over the two days. We had no problems at all and were very satisfied, many thanks.